A friend recently took me to an incredible hamburger restaurant. Although I don’t eat much meat, sometimes a good burger just hits the spot, especially in the dead of winter. But it takes the right formula to make it great — much like a good public relations strategy. Without the key components — quality meat, tasty toppings, a fresh bun and variety of sides — the overall experience will not be memorable. Developing a PR strategy is similar: It requires all the right ingredients to be successful. First, you have to consider the meat, since that is the main ingredient. Components such as whether it is organic, grass fed and locally raised can affect the quality of the final product. This is akin to the story that you need to tell. The meat is the message. Is it meaningful to a broad-enough audience? Is it newsworthy? Who will care about it? Is the messaging well thought out, and does it properly articulate what you need to convey? Are you sharing news of a client success or positioning your client as a source to be considered as a thought leader? If it is related to client work, has the client approved the message? Thinking through messaging (the meat) is incredibly important and is at the center of your entire PR strategy. Depending on your preferences, those toppings — lettuce, tomato, cheese, mushrooms, avocado, onions and especially a “secret sauce” — can make or break the burger, regardless of how well-seasoned and high-quality the meat is. Think of the toppings as your spokesperson. The messaging does not really matter if the right person isn’t delivering it. If you are positioning the client as a thought leader, have you run an internal conflict check? Do they have the background and authority to be considered a reputable source on the topic? Take the time to identify the most-credentialed, most-articulate person to deliver the message. Even if this person is a media relations pro, it is still worth taking a few minutes to review the key points you want to convey for every pitch or message. No matter how seasoned the spokesperson is, be sure to provide a list of the key messages — because even the most-experienced speaker can get nervous and go off-topic when the mic is hot. Try to anticipate the reporter’s follow-up questions and make sure the spokesperson is prepared to answer those as well. Practice how you or the spokesperson will answer the tough questions (the ones that you would rather avoid), and how to pivot and deflect, while still being honest and direct. The bun is a key component of the package because it ties everything all together. Whether toasted, sesame, gluten-free or brioche, making sure the bun is perfect is just like compiling your media list. Consider whether you are targeting major dailies, regional or trade media. Think carefully and strategically about the folks who will be interested in hearing about your news. Research the reporters’ beats to ensure that you are pitching them with sources who are relevant to their work. Reporters do not have a lot of time, so you do not want to waste it — or your credibility by sending a pitch that will annoy them and result in a reporter clicking “delete” the next time you send an email. Make sure you provide enough information about why the story is interesting and relevant without getting into the weeds with too many details. And whenever possible, provide windows of time when the spokesperson is available for interviews. Fries? Onion rings? Salad? A milkshake? What you get with your burger helps make the experience a memorable one, much like social media — there’s more to it than the main dish. Once the pitching is done and you have scored a few great interviews, be sure to share the information and results on social media. This will help the spokesperson build his or her own brand, and enhance the firm’s brand overall. But do not rely on or expect the spokesperson to do this alone. You may need to draft the social media posts on his or her behalf, including links to the coverage, if possible. And don’t be shy about asking other members of the firm to share on their channels as well. Sharing relevant and timely content is key to survival in this 24/7 media world. 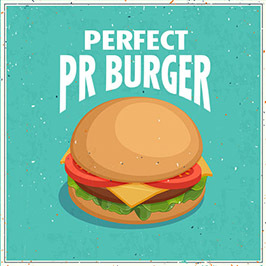 Looking for more tips on how to create your own perfect PR “burger”? Contact me at sholtzman@jaffepr.com.